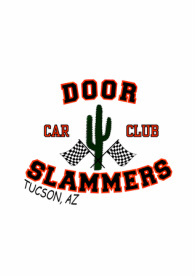 Door Slammers Car Club is located in Tucson, Arizona. Door Slammers Car Club was established February 21st, 2008. We Are a Non-profit family oriented car club. Many shows help raise awareness and funds for the Cancer Society. We love to support great causes and enjoy helping others by having car shows to support their business. We believe there is nothing that goes better together than a Saturday afternoon and classic cars! Club founder and President is Russ Wallace who is very proud of his club, the club members and Miss Holly, his beautiful 1978 GMC modified custom. Door Slammers Car Club is proud to offer a club with no membership fee other than your club shirt for unity. Door Slammers NEVER charges a registration fee at any of our car shows, we never charge spectators either. We soley rely on the good hearts of Tucson for their generous donations which help raise funds and awareness for local charities. We never limit the type of vehicle to enter our shows either! Depending on the wants of the business we are hosting the show for, we may end up with trophies for each class but in many cases we have 1st 2nd 3rd and Best of Show or People's choice awards. All vehicles registered have the opportunity to win!